Grooming a horses mane is particularly important, especially before plaiting and if you are competing in an equestrian competition or event. There are also considerations involved in the lay of your horses mane and whether you should cut or pull the mane. 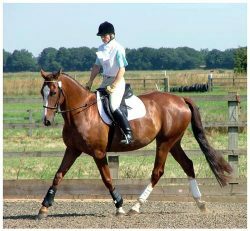 Different types of pulls or cuts can be correctly applied to different types of horses or for different types of horse shows or equestrian competition. Keeping your horses mane on the correct side can be a problem. Traditionally horses manes are meant to lay on the off side; which is the right side of your horses neck. But a lot if us have horses who do not have the perfect mane (ours definitely don’t) and manes can vary in thickness, in length, by coarseness or in a multitude of other ways. Horses manes also vary by breed and can sometimes be a different colour to the horses body hair. Some manes lay flat, some lay half one side and half the other, some lay as if they have a centre parting and some just like the left side better. The usual advice is to plait the mane over to the right, but this only trains the mane in different directions, instead of straight down the neck. Instead of plaiting, bunch the mane in one inch sections with bands, making sure the band is at the bottom of the hairline, next to the neck, otherwise you will be training it to stick up. You will have to re-do each bunch regularly if your horse rubs its mane and the bunches move which means it’ll be training the mane the wrong way again. You should have about 30 little bunches along the neck and it will usually take about 3 days to work. If your horses mane lays completely on the wrong side, bunch it this way and it should always lay on the correct side. It is more difficult if your horse has a very wide mane line on his crest as it will usually fall on both sides. Pull the mane to thin it out and then bunch it to help it lay properly. A picture paints a thousand words, as they say, and this video presentation will demonstrate how to plait a horses’ mane better than any words could. Plaiting a horses’ mane helps to show off the line of the neck and emphasises the neck conformation and overall look of the horse.